The University of Cape Town just announced a new project called "The UCT Stem Cell Initiative". Purpose of the project is to create "disease-in-a-dish' models using induced pluripotent stem cells. In collaboration with scientists from Oxford and Japan, the UCT researchers have already established the first iPSCs lines from South African patients suffering from an inherited neurodegenerative disease called spinocerebellar ataxia type 7 (SCA7) and have even created neurons and retinal cells from these cells, which will be used to study the disease. The researchers also said they are in the process of creating more lines for other conditions, including myasthenia gravis. "Since these iPSCs are derived from adult skin, they also bypass many ethical issues associated with embryonic stem cell research," said Kidson. 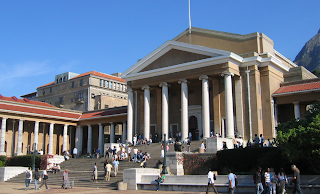 View of UCT's Upper Campus. Spinocerebellar ataxia type 7 (also known as autosomal dominant cerebellar ataxia type 2) is a type of ataxia among a group of inherited diseases of the central nervous system. As in many other inherited ataxias, it is the result of genetic defects that lead to impairment of specific nerve fibres carrying messages to and from the brain, causing cerebellum degeneration. Myasthenia gravis is an autoimmune neuromuscular disease leading to fluctuating muscle weakness and fatigability.